This was a winner! Balsamic vinegar was a theme throughout this Rachael Ray recipe, which was fine with me. 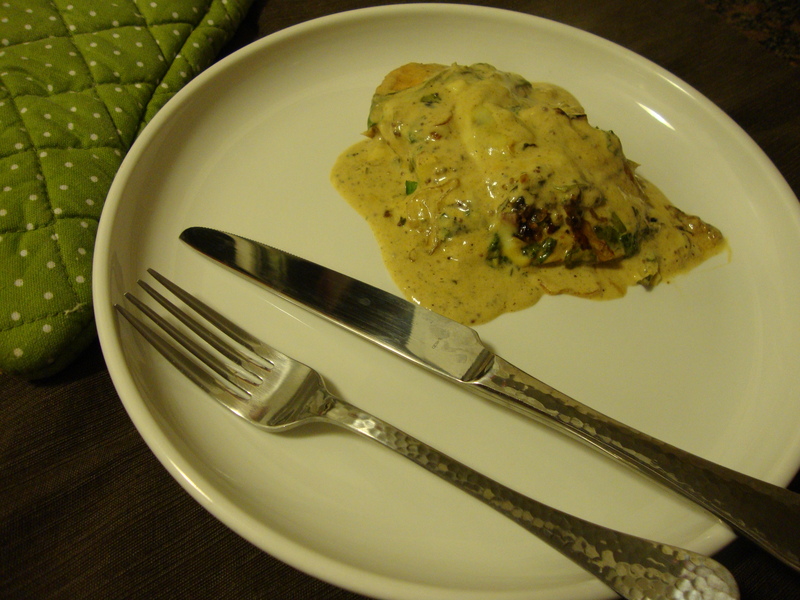 The chicken was super flavorful and the fresh ravioli alongside in a simple sauce was the perfect accompaniment. All in all, pretty simple and really delicious. Cooking chicken breasts is not my favorite, but these turned out great despite not thinning them out a little with a meat mallet. I turned them several times and got a great sear on the chicken without drying them out. The salad was a little salty so take it easy with the seasoning. Pick a yummy ravioli in the fresh food case–I got a good one from a local Italian shop. Don’t cook the ravioli for long — if anything, undercook, as it will cook more once you mix everything together. Bring a large pot of water to a boil for ravioli. Salt water and drop ravioli in water. Cook 8 minutes or until raviolis expand, float to top of water, and are al dente. Heat a medium nonstick skillet over medium high heat. Add chicken breasts and cracked garlic to the pan. Cook chicken 12 minutes, or until juices run clear, turning occasionally. The balsamic vinegar will produce a deep brown, sweet finish on the chicken as it cooks. When the chicken is 2 or 3 minutes away from done, heat a second skillet over medium low to medium heat. To the second skillet, add butter to the pan and let it begin to brown. Remove chicken from the first skillet and transfer to a warm platter. In a skillet over medium high heat and add the pancetta. Brown the pancetta bits, about 2 or 3 minutes, then transfer to paper towels to drain and return pan to heat, reducing heat to medium. 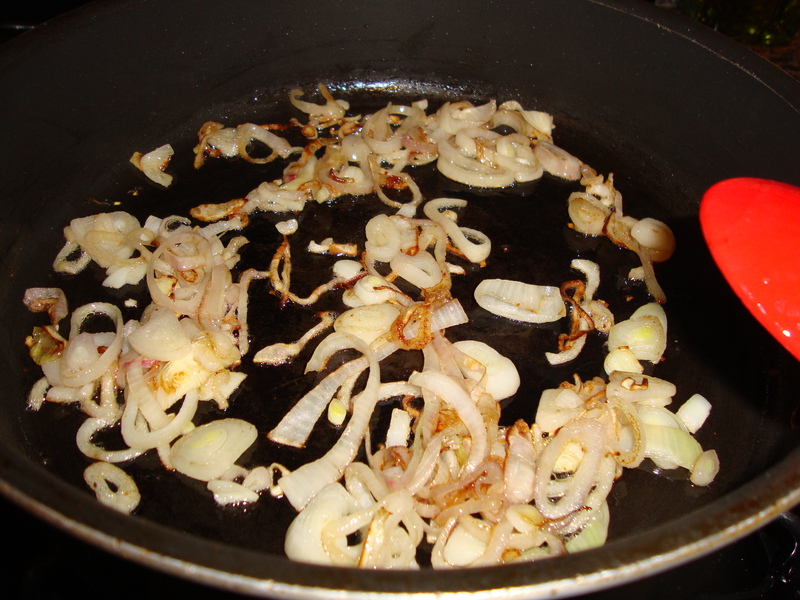 Add oil and shallots to the pan and let the shallots saute 2 minutes. When the butter for the ravioli has browned, add cooked ravioli to the pan and turn in butter to heat through. Add balsamic vinegar to the ravioli and cook a minute or 2 longer to reduce the vinegar and glaze the ravioli. The vinegar will become thick and syrup like. Add cheese, parsley, salt and pepper to the pasta and remove the pan from the heat. 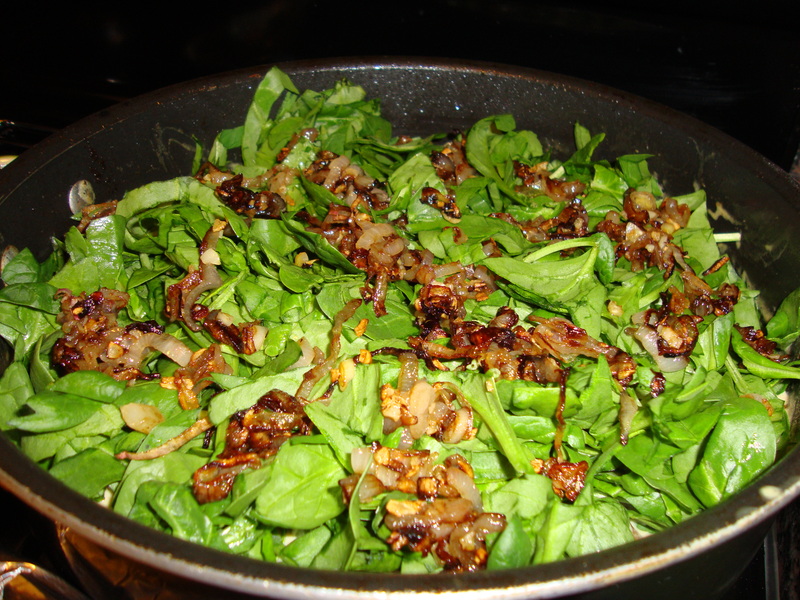 To the sauteed shallots for the spinach salad, add sugar and cook sugar with shallots 1 minute. Add vinegar to the pan, scraping up pan drippings. Add spinach to the dressing and turn to wilt and coat it evenly in sweet vinaigrette. Add crisp pancetta to the salad. 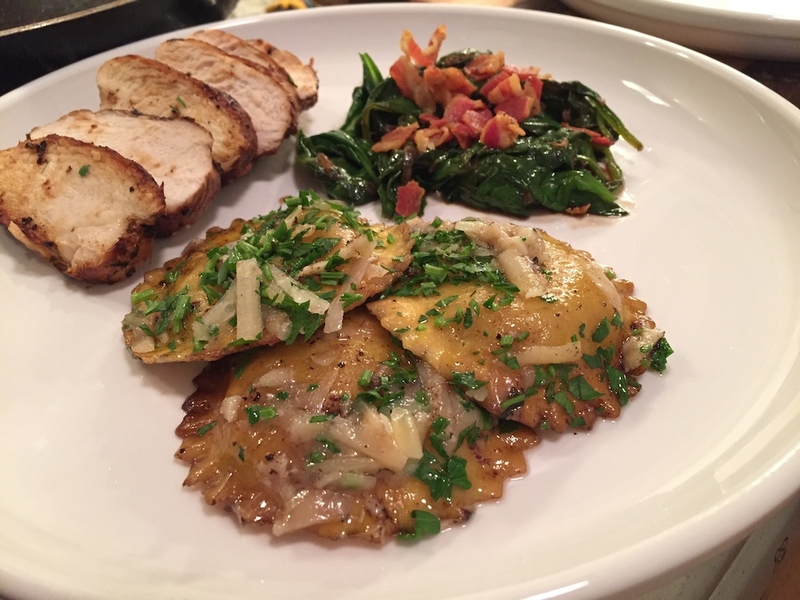 Serve chicken along side ravioli and spinach salad, all on the same dinner plate. 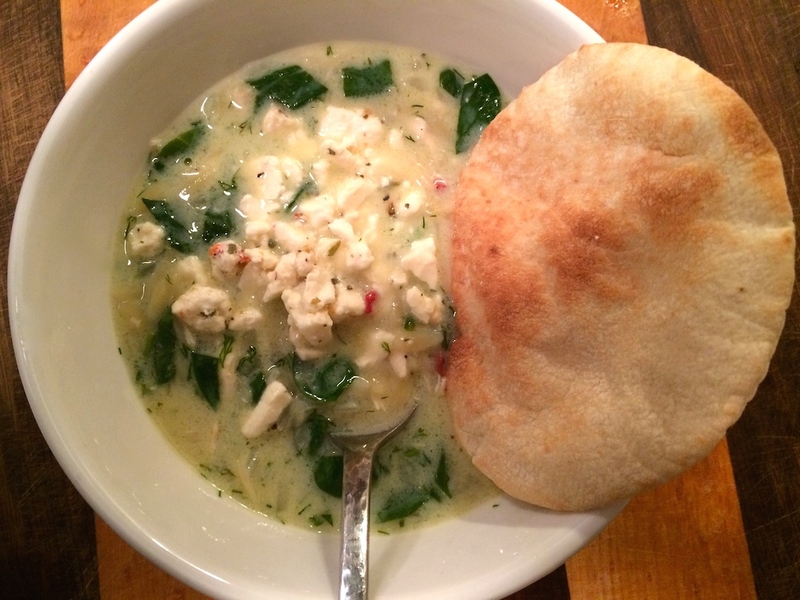 It’s getting to be soup weather in New York — complete with a rainy Nor’easter. This soup has some nice bright flavors from the lemon and dill, and it cooks up in 30 minutes — the perfect comfort food on a chilly night. I’ve never made soup with egg in it before — it adds a nice creaminess without cream or milk — just make sure you whip it thoroughly before stirring it in. Quick, easy and the leftovers are delish! The recipe calls for pastina, which you could probably find at a specialty Italian grocer. I opted for orzo, but you could also use Israeli couscous or any small pasta. I used shredded roasted chicken and threw it in at the end to heat through, instead of putting the whole chicken on the bone in the pot. 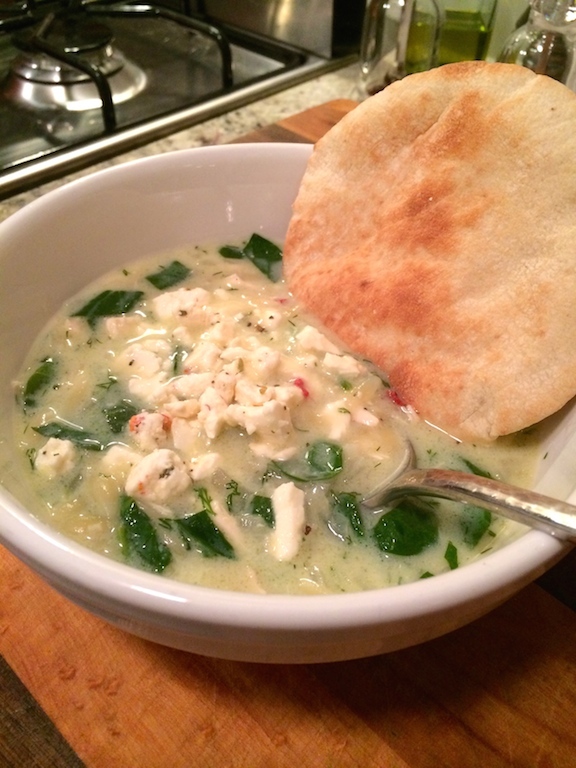 Serve with pita or flat bread. Heat the 1/4 cup olive oil in a large pot over high heat. Add the onion, 1 teaspoon salt, and pepper to taste; cook until slightly softened, about 5 minutes. Add the chicken, the broth, 4 cups water and the juice of 1 lemon; cover and bring to a boil. Reduce the heat to medium, add the pastina/orzo and simmer until the pasta is cooked and the soup thickens slightly, about 15 minutes. Remove the chicken; when cool enough to handle, pull the meat off the bone and shred into bite-size pieces. In honor of my sister and brother-in-law running the Chicago Marathon earlier this month and posting some pretty dang impressive times in the process (4:08 and 4:24 respectively), I present you the Chicago Steakhouse Sandwich (recipe courtesy of Jeff Mauro, “The Sandwich King”). This is one delicious sandwich, and I love me a good sandwich. 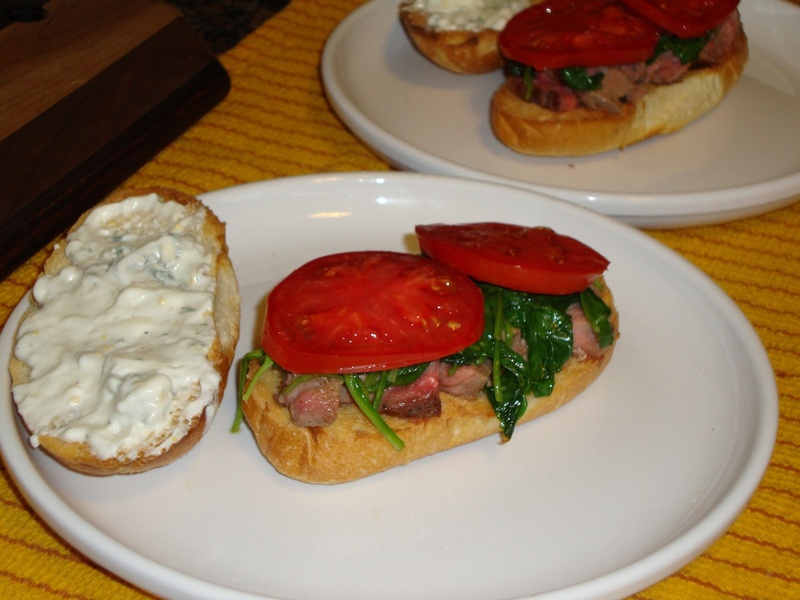 It starts with juicy, medium rare ribeye, topped with a garlicky spinach with a little heat from red pepper flake, topped with a blue cheese buttermilk spread on a crusty roll. Yum. I also added some super ripe beefsteak tomato slices, since everything is better with tomato. Add a pickle on the side, and you’re good. This came together so quickly — it’s a perfect weeknight meal since it won’t take you more than 30 minutes to throw it together. It’s so easy, I don’t have any tips! For the steak: Heat a cast-iron skillet over high heat until very hot. Sprinkle both sides of the steak with salt and pepper. Place the steak in the hot skillet, reduce the heat to medium and sear until well browned, about 4 minutes. Flip the steak and cook until medium/medium-rare, about 6 more minutes. Set aside, loosely covered with foil, and let rest before slicing. For the sauteed garlicky spinach: Heat the oil and sliced garlic in a Dutch oven over medium heat, stirring occasionally until the garlic is golden brown and crispy. Remove the garlic and set aside on a paper towel to drain. Add the crushed red pepper and cook until fragrant, about 30 seconds. Add the spinach and stir to combine with the oil. Cover and let cook over medium-high heat until the spinach is wilted but still bright in color, about 4 minutes. Season with salt and pepper and toss with the garlic chips. 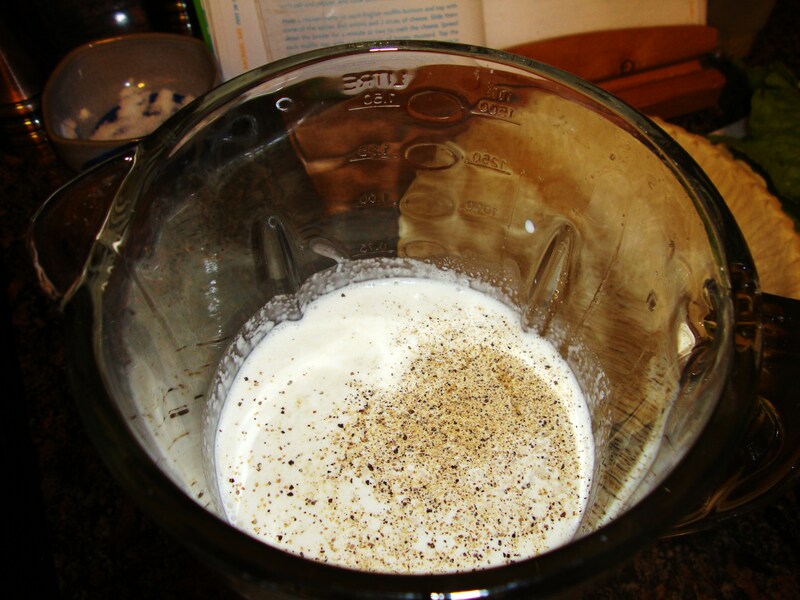 For the buttermilk blue cheese dressing: Mix the mayonnaise, buttermilk, blue cheese, dill, mustard and pepper together in a bowl and set aside. Adjust the seasoning if necessary. 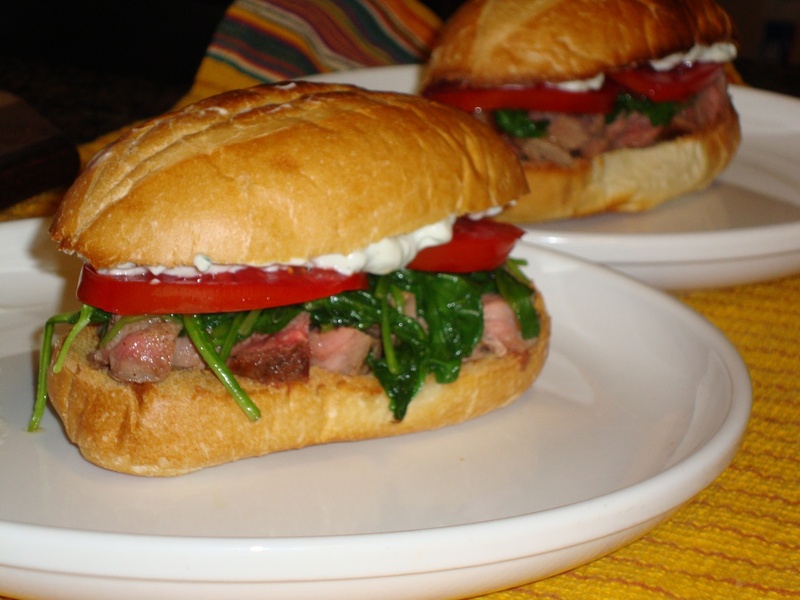 For the sandwich build: Slice the rested steak against the grain into 1/4-inch slices, removing any non-rendered fat. 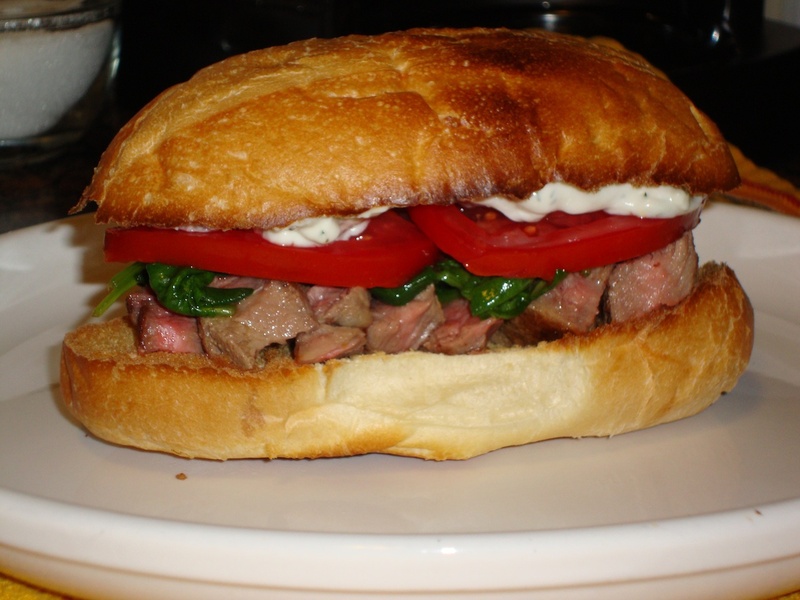 Place the steak slices on the bottom bun, top with the spinach and schmear the top bun with buttermilk blue cheese dressing. 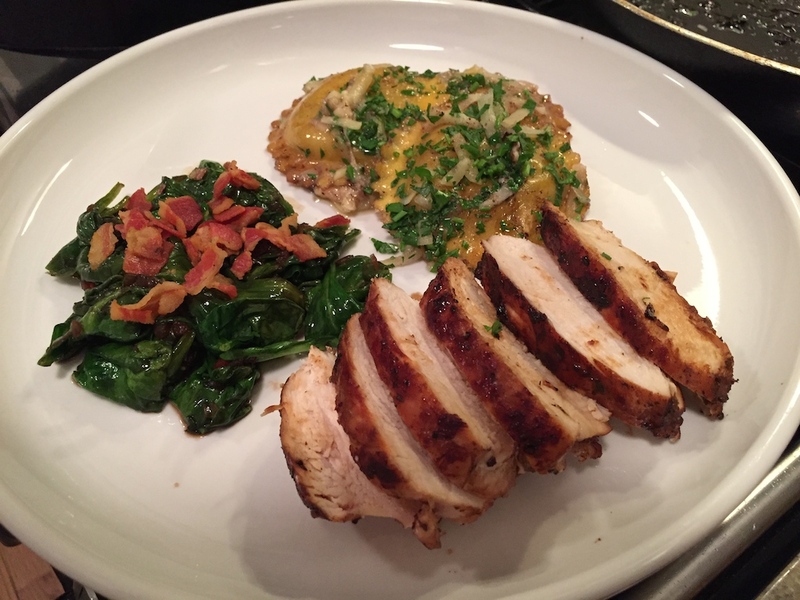 I’m a big fan of mustard — pretty much any kind — so I loved this tangy Chicken Dijon by Guy Fieri. 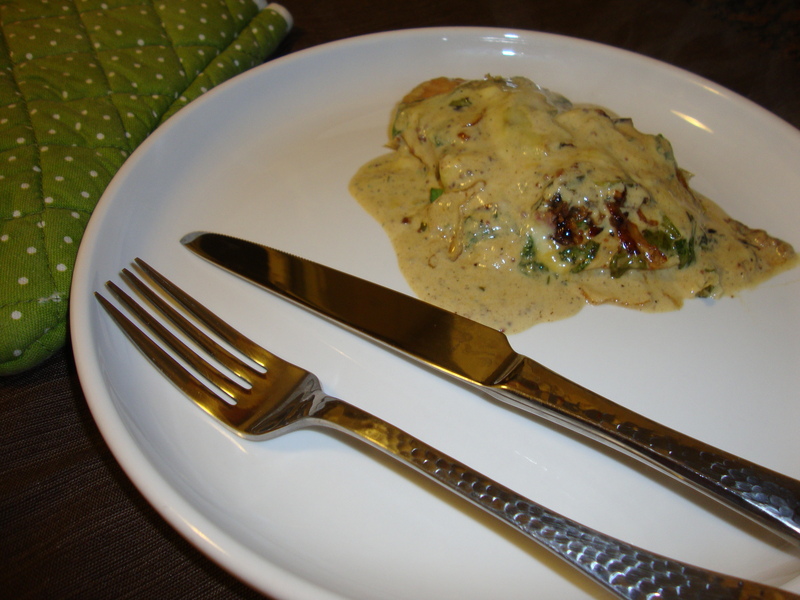 The sauce combines two types of mustard with white wine and cream, so it’s rich but a great bite from the mustard. Guy then tops it with a bunch of spinach and some caramelized shallots and garlic, and finally some melty Swiss cheese. Yum! The final product was full of delicious mustard and garlic flavor. I’d recommend serving this with a vegetable — I thought the spinach would do the trick but it cooks down a lot so it didn’t really feel like enough of a vegetable. You’ll want something that can stand up to the strong flavors of this dish — my favorite spicy broccoli would work magnificently. If you don’t have an ovenproof skillet (one that doesn’t have a handle covered in plastic), just cover the handle with a couple layers of tin foil (see above). It’s worth it to seek out the shallots (they have a milder flavor), but if you can’t find them, use a small onion. I didn’t have granulated garlic, so I just used garlic powder. In a resealable 1-gallon plastic bag, dissolve the 1/4 cup kosher salt and sugar in the water. Add the chicken, seal tightly, and refrigerate for 1 hour or up to 8 hours. Preheat the oven to 275 F.
In a large oven-safe skillet over medium-high heat, melt 1 tablespoon of the butter in 1 tablespoon of the oil. Add the shallots and cook until golden, stirring occasionally, about 3 minutes. Add the minced garlic and cook for 30 seconds more. Remove from the pan. Do not rinse the pan. Remove the chicken from the brine, rinse, and pat dry. Slice the breasts in half horizontally, so that each piece is about 1/2-inch thick. Trim any fat. Season the flour with the remaining 1 teaspoon salt, pepper, and granulated garlic and combine well. Dredge the chicken breasts in the seasoned flour. Combine the remaining 2 tablespoons oil and 3 tablespoons butter in the skillet and turn the heat to medium-high. Working in batches, add the chicken (do not crowd) and cook for 3-5 minutes, until browned on one side. Turn the chicken over and cook for 2-3 minutes to brown the other side. As the chicken finishes cooking, place it on a baking sheet in the oven to keep warm. Repeat with the rest of the chicken. Pour the wine into the pan and cook until the pan juices are reduced to 2 tablespoons, about 3 minutes, scraping the browned bits off the bottom of the pan. Stir in the mustards and stock until smooth. Stir in the cream. Bring the sauce to a simmer, stirring frequently. Return the chicken breasts to the pan, turning to coat them evenly in the sauce and incorporate the coating into the sauce (this helps to thicken the sauce). Increase the oven temperature to a low broil if you have it and make sure there’s an oven rack in the top third of your oven, or to 500 F if not. Evenly sprinkle the spinach on top of the chicken, evenly distribute the shallots and garlic on top of the spinach, and top with the cheese. 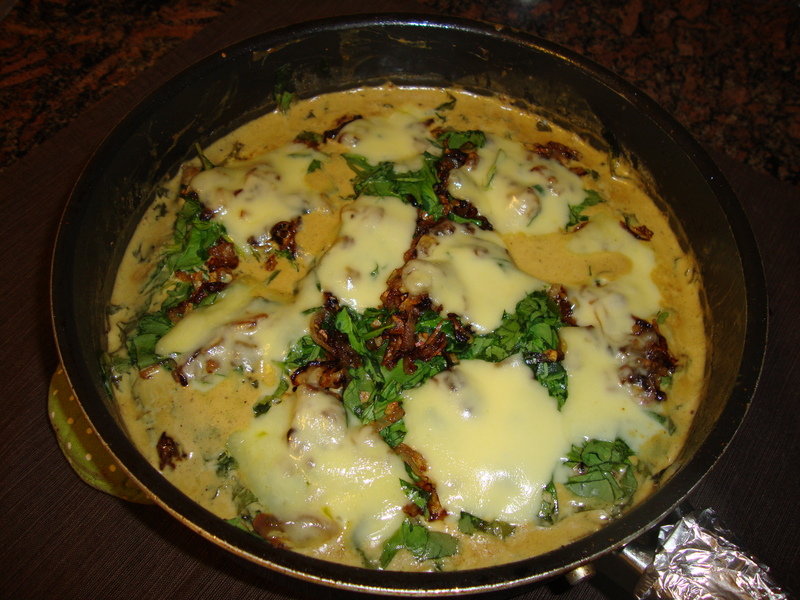 Broil or bake in the oven until the cheese is melted and just starts to brown in some spots. Remove the pan from the oven and let it rest on a heatproof surface for 5 minutes before serving. I love quiche. Since this is my second quiche post, I guess that much is obvious! Ah quiche… it’s like a casserole but French and fancy — and people don’t realize just how easy it is to throw one together. Pair it with a salad and you’ve got a meal. 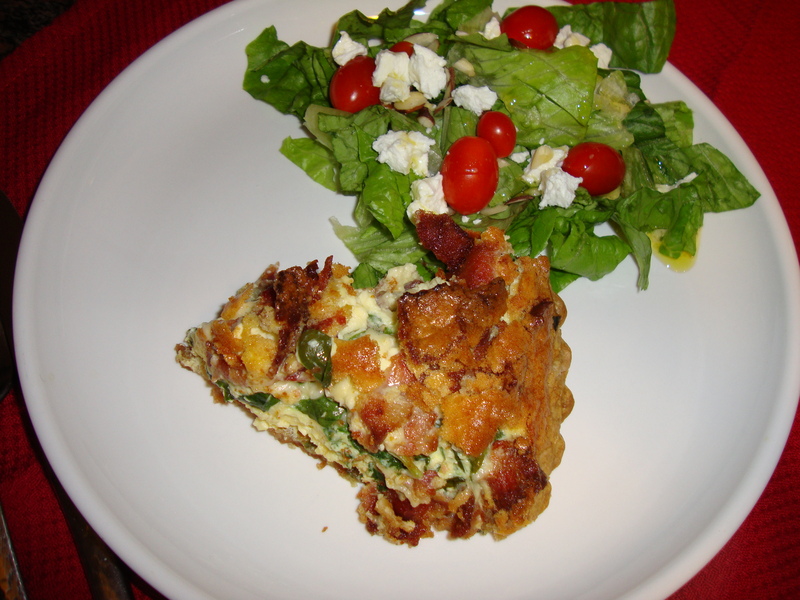 This spinach and bacon quiche by Paula Deen is pretty darn yummy. 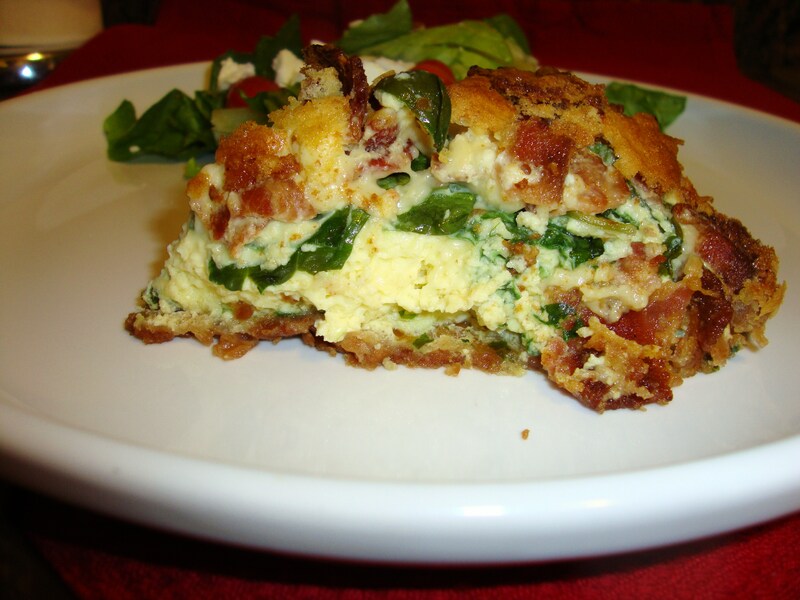 The key ingredients: bacon, spinach and swiss cheese, all baked with eggs and cream in a crust. I use pre-made — it’s so much easier and makes for a really fast meal. If you want to make your own, be my guest. It would probably take this to the next level! But even with a pre-made crust, you get the buttery flakiness and crunch against the salty, cheesy egg filling. Oh la la! The recipe calls for layering the bacon, spinach and cheese in the pie crust, then pouring in the egg mixture. 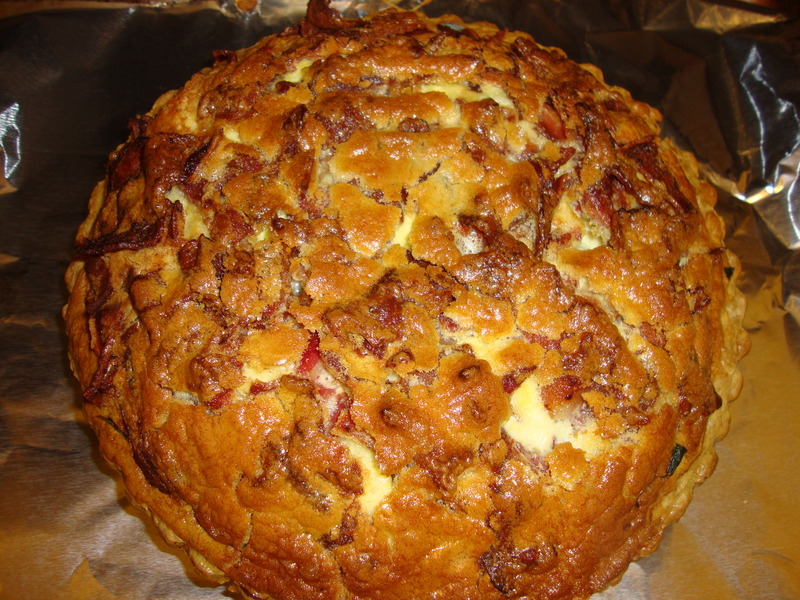 I put the bacon in last, but that made the top a little bit funky — more browned than I would like, and rather un-quiche-like. I recommend putting the bacon in first, then spinach and cheese, and gently pressing it down a little bit before pouring in the eggs. This had to cook a little bit longer than the recipe indicates in order to set the middle. But other than that, I have no tips — it’s that easy! I served this with a green salad with a simple vinaigrette — whisk together a minced shallot, white wine vinegar, Dijon mustard, salt and pepper and extra virgin olive oil, and voila — delicious dressing. Some people even say you can throw it all in a blender to make it. I’ve never tried it, but next time, I will! Combine the eggs, cream, salt, and pepper in a food processor or blender. 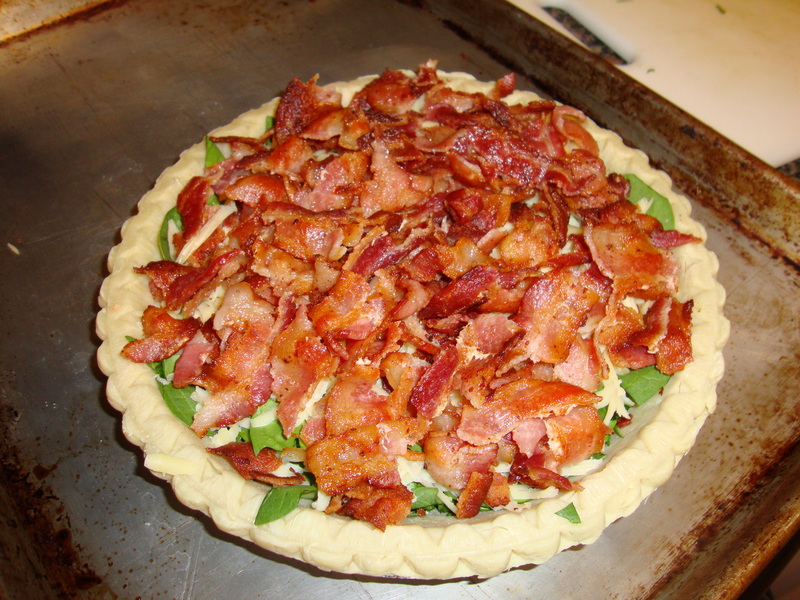 Layer the spinach, bacon, and cheese in the bottom of the pie crust, then pour the egg mixture on top. Bake for 35 to 45 minutes until the egg mixture is set.